Rigid-flex printed circuit boards means hybrid systems, which combine the characteristics of rigid and flexible circuit substrates in one product. Whether in medical technology, sensors, mechatronics or in instrumentation, electronics squeezes ever more intelligence into ever smaller spaces, and the packing density increases to record levels again & again. Using flexible PCBs and rigid-flex printed circuit boards, whole new horizons open up for electronic engineers and designers. Flexible base material: Flexible base material consists of a foil made of flexible polyester or polyimide with tracks on one or both sides. CONTAG uses polyimide materials exclusively. Depending on the application, we may use Pyralux and Nikaflex made by DuPont and the glueless flexible laminates in the FeliosFlex series made by Panasonic. Apart from the thickness of the polyimide, the materials mainly differ in their adhesive systems (glueless or on epoxy or acrylic basis) as well as in the copper quality. For comparatively static bending applications with a low number of bend cycles (for assembly or maintenance) ED (electro-deposited) material is adequate. For more dynamic, flexible applications RA (rolled annealed) materials must be used. Materials are selected on the basis of the product and production specific requirements, and the datasheets of the materials used can be requested as required. CONTAG mostly uses no-flow prepregs as bonding agents. of the flexible material, and for double-sided circuits it is approx. 12 x the thickness. To be able to assemble the components on a board, to solder & check them, a stiff frame with defined breaking points should be used. Blanks can contain single or multiple boards. CONTAG manufactures rigid-flex printed circuit boards with flexible external or internal layers. In principle rigid-flex printed circuits can be soldered without restrictions using the parameters for rigid printed circuits. As polyimide film is however very hygroscopic, it is vital to dry the item before soldering. If this is not done, delamination may occur, bubbles may form or sleeves may rip out during the soldering process. We recommend drying for > 2 h at 120°C and then processing immediately (< 6 h) afterwards. 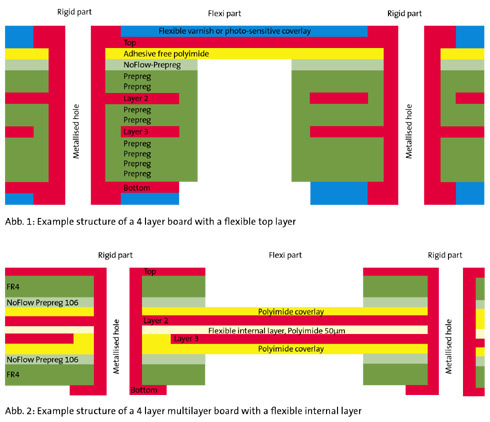 When designing rigid-flex printed circuits, there are many possible options for the construction and for the materials used.